When we open native or .NET windows executables in a hex-editor we can notice that almost all of them contains strange “This program cannot be run in DOS mode” text at the beginning of the file. The original purpose on this text and surrounding it small MS-DOS program, called MS-DOS stub is to print message to the user and then exit if the .exe file is run from under MS-DOS. I in this blog post I will explain how it works and since currently I have only GNU/Linux boxes in my flat I will investigate using only Linux. Now when we have a .NET and a 64-bit .exe files we may look at them using hex-editor (I will use Bless here): MS-DOS Stubs in both files looks very similar. This is quite unexpected because we used two completely different compilers to create them. Let’s confirm our assumptions first by extracting MS-DOS Stubs and then by comparing them. In case of both files MS-DOS Stubs end on 0x80 offset. At that offset we can see “PE” letters that mark start of PE headers (“PE” means Portable Executable, this is the name of .exe file format used by Windows). These letters are often called a Magical Number or a file signature. This is similar to MZ letters that are always present at the beginning of MS-DOS executables. So indeed MS-DOS Stubs are identical. C:\> REM And we are done! We may use CLS command to clear the screen and attempt to run our .exe files. For those that never used MS-DOS, this system supports only short files names (eight letters for file name plus three letters for extension, so called 8.3 format). That is why our HelloWorld.exe is displayed as HELLOW~2.EXE. Everything works as expected. But that is not all of it. 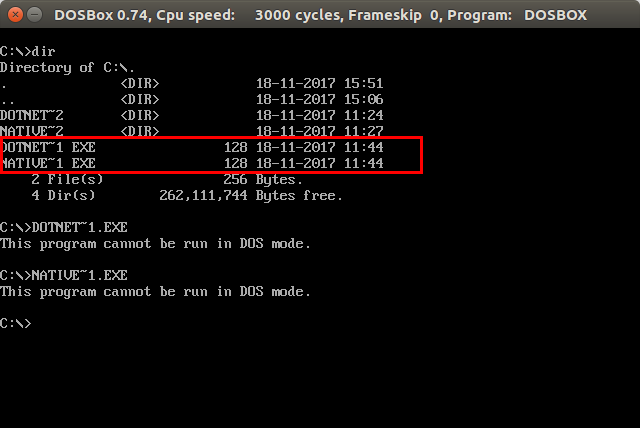 Instead of our .exe files we may run our extracted MS-DOS Stubs and they also work without any problems: This suggest that MS-DOS Stubs are just tiny MS-DOS EXE programs (in MZ format) embedded in PE files. To extract these values I wrote a small Java program. Source code is available as a GitHub Gist here. All values in both MS-DOS file header and in PE headers are stored using little-endian convention. This means that a four byte integer e.g. 0x11223344 will be represented on disk by bytes 0x44 0x33 0x22 0x11 (least significant byte first). Of course this applies only to multi-byte types supported by CPU (short, int, long, double and float). Also because characters in ASCII strings are represented by single bytes they are not affected by endianness. For example string “foo” is represented on disk as 0x66 (f) 0x6f (o) 0x6f (o) in both little-endian and bit-endian conventions. I must admit that most of values in MS-DOS header seem magical to me. The most important thing that I learn by looking at the header was its size: 64 bytes. 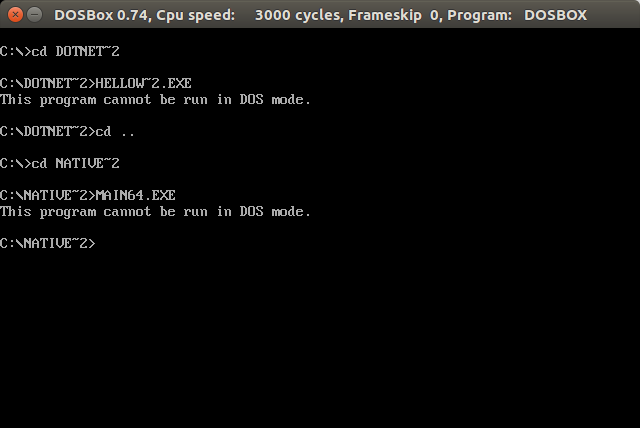 So after first 64 bytes of MS-DOS Stub I expect to find some MS-DOS code. MS-DOS divides memory in 64k segments. Programs refer to a specific address in memory using segment:offset pair. segment value is set by MS-DOS when program is loaded and is stored in special CPU registers like CS (code segment) or SS (stack segment). e_ip value of MS-DOS header points to the first instruction of the program (to be more precise e_ip is offset inside e_cs code segment). While reading resulting assembly code we must remember that our tiny program stores both “This program cannot be run in DOS mode” message data and code in the same segment. 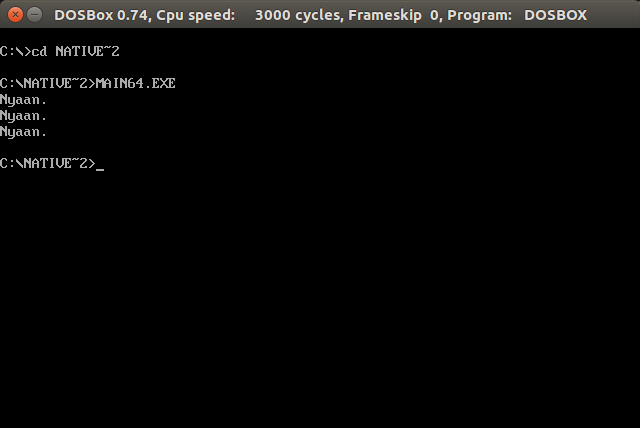 Since the message starts at offset 0x0E we may assume that int 0x21 is the last instruction of the program. ; # 64k byte area of memory. ; # to load any data. The main idea here is that we keep loop counter on the top of the stack and we load counter into bx register only to decrement it or to compere it with zero. I keep the counter value on the stack because I don’t know if contents of bx register is changed by int 0x21 interrupt (yeah I am too lazy too check). 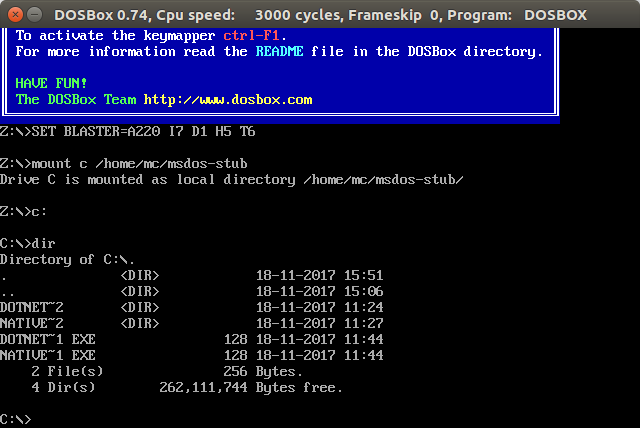 If you have some spare time you may play with other MS-DOS and BIOS interrupts to print colorful messages or to beep at the user. # Check it works on "Windows"